For other ships with the same name, see HMS Royal Sovereign. HMS Royal Sovereign was a 100-gun first rate ship of the line of the Royal Navy, built at Woolwich Dockyard and launched in July 1701. She had been built using some of the salvageable timbers from the previous Royal Sovereign, which had been destroyed by fire in 1697. 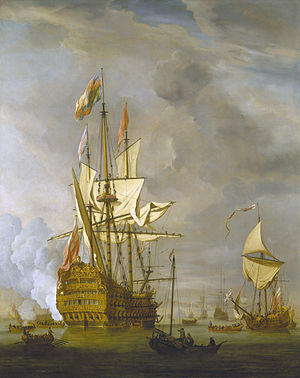 She was Admiral George Rooke's flagship in the War of the Spanish Succession. Royal Sovereign formed the basis for the dimensions for 100-gun ships in the 1719 Establishment, being a generally well-regarded vessel. In practice, only Royal Sovereign herself was affected by this Establishment, being the only first rate ship either built or rebuilt to the Establishment in its original form, but the Royal William and Britannia had been rebuilt to the same dimensions (approximately) when both were re-launched in 1719. She underwent her rebuild to the 1719 Establishment at Chatham after an order of 18 February 1724, being relaunched on 28 September 1728. The rebuilt Royal Sovereign remained in service until she was broken up in 1768, ending her career with a total of 67 years' service in the Royal Navy. In the 2013 video game Assassin's Creed IV: Black Flag, HMS Royal Sovereign, partnered with HMS Fearless, appears as one of the legendary ships which the protagonist Edward Kenway could encounter and sink in the Caribbean sea. As the two ships sail and fight together, either Royal Sovereign and Fearless are both sunk in battle with the Jackdaw, or neither of them are. ^ a b Lavery, Ships of the Line vol.1, p165. ^ Lavery, Ships of the Line vol.1, p163. ^ Lavery, Ships of the Line vol.1, p76. "British First Rate ship of the line 'Royal Sovereign' (1701)". Three Decks. Retrieved 12 April 2019.